Last night Adam Lind capped a break-out season with a three-HR burst. Together with Marco Scutaro and Aaron Hill, he provided some excitement in an other wise forgettable year for the Toronto fans. Lind has emerged as a major power threat. Those three bring his total up to 35 and his wOBA of .394 makes him one of the ten best hitters in the AL this year. Here I display his HRs in a way I started doing over at Baseball Analysts. 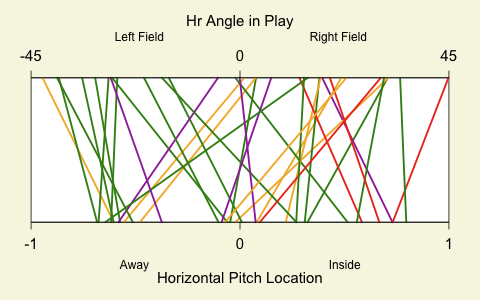 Along the bottom I plot the horizontal location of the pitch he hit for a HR. Lind stands to the right of the image as a lefty. Then I connect that point to the horizontal angle of the HR. I color coded the lines by pitch type, with the same colors used here in the pitchf/x section. Just to make things a little simpler I grouped all fastballs (four-seam, two-seam and cut) into one group. Lind has great plate coverage, hitting HRs on pitches across most of the plate. In addition he has power to all fields, hitting a number of opposite (left) field HRs. For the most part he pulls inside pitches and goes the other way with outside pitches. There are some other interesting trends. The sliders (red) he hit for HRs were all on the inside half of the plate, while the changeups (yellow/orange) were middle-away. He pulls changeups more often, while going the other way with fastballs. As Dave Cameron noted a couple months ago Lind’s trip to this point has been bumpy (with concerns of the dreaded AAAA tag coming into this year), but he has made it in a big way. We hoped you liked reading Lind Finishing Up with a Bang by Dave Allen! Good graph once again Dave. Part of me wonders how much of Lind’s 3 HR’s came as a result of the Red Sox current pre-playoff catatonic state, to be fair though.